Slam Dunk Festival reveals This Year’s Stage Splits! 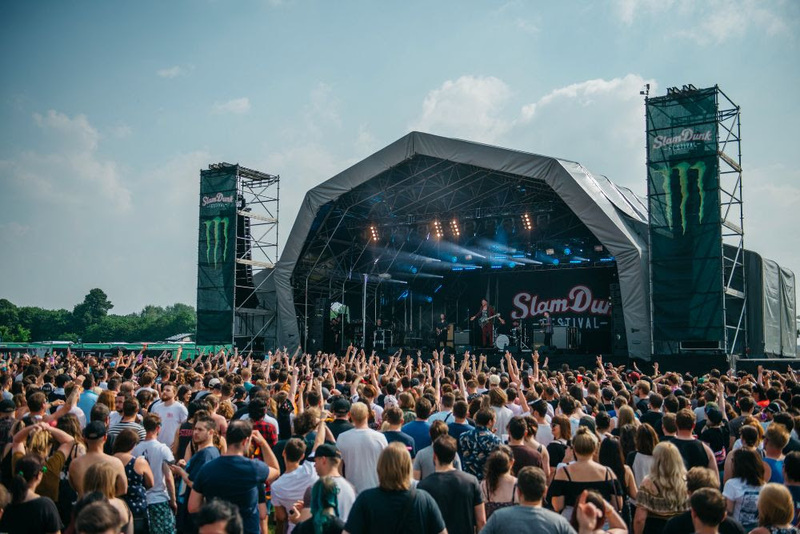 With a lineup bursting with the very best names in alternative music, Slam Dunk Festivalis thrilled to reveal stage splits for the May bank holiday weekender, which is set to touch down in Leeds Temple Newsam Park for the very first time and return to Hatfield Park after the success of last year’s greenfield event. In addition to this, Slam Dunk Festival have also revealed travel information and further afterparty details. In what promises to be an unforgettable festival moment, this year’s Slam Dunkheadliners All Time Low are set to round off the Monster stage with a homage to their 2nd album ‘Nothing Personal’ after a non-stop day of pop-punk mastery. Florida’s finest New Found Glory will appear alongside Welsh set-up Neck Deep for a back-to-back supply of alternative bangers. Montreal’s iconic rock pack Simple Plan are set to join them, alongside ‘Stupid For You’ hitmakers Waterparks, US-Brit rockers As It Is and crowd-pleasing front-runners Boston Manor and WSTR. Carefully curated by NOFX’s very own Fat Mike, Slam Dunk’s very first Punk In Drublicstage takeover will see NOFX headline, following defiant performances from more beloved punk names. The iconic Bad Religion, ska-punk six piece Less Than Jake, original punk-rockers Lagwagon and Sweden’s hottest exports Millencolin are set to storm the takeover. Guaranteed to be the ultimate destination for punk rock, it will also see LA ska-punks The Interrupters, Mad Caddies, Anti-Flag and The Bombpops appear on the stage. One of two heavy stages at this year’s Slam Dunk Festival, metalcore and everything in between can be found on the Jagermeister Stage as UK metal titans Bullet For My Valentine will appear in a powerful headline performance set to incite mosh-madness.Atreyu are set to show both acts and audiences alike how it’s done, bringing their influential metalcore hybrid to the stage, alongside emo icons Silverstein who are set to release their latest studio album ‘Redux: The First Ten Year’ in April. The Word Alive will deliver their notoriously exhilarating performance while Missouri rockers Story Of The Year, Wage War and The Plot In You are destined to get adrenaline levels sky-high. Headlined by The Menzingers, the Dickies Stage will see emotion-driven LA nativesTouche Amore, US revival pack Tiny Moving Parts, and American stalwarts The Get Up Kids and Saves The Day take to the stage for a complete education in all things emo. Completing the stage and making for an indisputable display of alternative music will be esteemed two piece Tigers Jaw and none other than Brit punks Milk Teeth. Appearing this May for a debut Slam Dunk Festival performance, Plain White T’s are set to headline the Marshall Stage. Before hearing the band’s pop-rock classics, festival goers can recognise the Marshall Stage as a home for heartfelt sing-a-longs delivered by evolving indie-rockers Hellogoodbye, cherished Illinois natives Real Friends, Seawayand Trophy Eyes. The stage will also see A Loss For Words’ UK reunion on the 10 year anniversary of their undeniable album ‘The Kids Can’t Lose’. Paying homage to the beloved Leeds institution, The Key Club Stage will recreate venue magic on their stage at Leeds and Hatfield with incredible alternative names jam packed on to the lineup. Topping the bill will be enigmatic electro-rock duo iDKHOW in a SlamDunk Festival debut performance that is sure to make history. Joining them will be alt-pop sensation Lights, billboard-charting grandson and the face-melting Employed To Serve. Birmingham metallers SHVPES will meet Aussie Between You & Me ahead of Story Untold 's pop-punk performance. Press To Meco, Our Hollow Our home, Kublai Khan, Cruel Hand, Pagan and Wallflower will complete the genre-crossing showcase, with secret special guests still to be announced.